A 3D printing technique can be used to create intricate structures, such as the replica of the structure of graphene shown in the photo, from a novel material made from seaweed-derived alginate and the nanomaterial graphene oxide. Photo: Wong Lab/Brown University. Researchers at Brown University have found a way to use graphene oxide (GO) to add some backbone to hydrogel materials made from alginate, a natural material derived from seaweed that's currently used for a variety of biomedical applications. 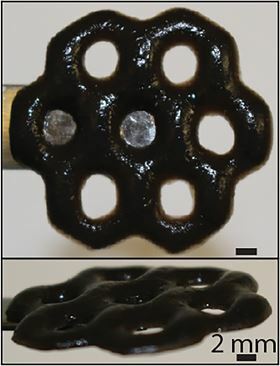 In a paper published in Carbon, the researchers describe a 3D printing method for making intricate and durable alginate-GO structures that are far stiffer and more fracture resistant than alginate alone. "One limiting factor in the use of alginate hydrogels is that they're very fragile – they tend to fall apart under mechanical load or in low salt solutions," said Thomas Valentin, a PhD student in Brown's School of Engineering who led the work. "What we showed is by including graphene oxide nanosheets, we can make these structures much more robust." The material is also capable of becoming stiffer or softer in response to different chemical treatments, meaning it could be used to make ‘smart’ materials that are able to react to their surroundings in real time. What is more, alginate-GO retains alginate's ability to repel oils, giving the new material potential as a sturdy antifouling coating. One advantage of this printing method is that the sodium alginate polymers link together through ionic bonds. These bonds are strong enough to hold the material together, but they can be broken by certain chemical treatments. That gives the material the ability to respond dynamically to external stimuli. Previously, the Brown researchers showed that this ‘ionic crosslinking’ can be used to create alginate materials that degrade on demand, rapidly dissolving when treated with a chemical that sweeps away ions from the material's internal structure. "The addition of graphene oxide stabilizes the alginate hydrogel with hydrogen bonding," said Ian Wong, an assistant professor of engineering at Brown and the paper's senior author. "We think the fracture resistance is due to cracks having to detour around the interspersed graphene sheets rather than being able to break right though homogeneous alginate." The extra stiffness enabled the researchers to print structures with overhanging parts, which would have been impossible using alginate alone. But the increased stiffness didn't prevent alginate-GO from responding to external stimuli like alginate alone can. The researchers showed that bathing the materials in a chemical that removes the ions caused them to swell up and became much softer. The materials then regained their stiffness when ions were restored by bathing them in ionic salts. Experiments showed that the materials' stiffness could be tuned over a factor of 500 by varying their external ionic environment. "You could imagine a scenario where you can image living cells in a stiff environment and then immediately change to a softer environment to see how the same cells might respond," Valentin said. That could be useful for studying how cancer cells or immune cells migrate through different organs throughout the body. "These composite materials could be used as a sensor in the ocean that can keep taking readings during an oil spill, or as an antifouling coating that helps to keep ship hulls clean," Wong said. The extra stiffness afforded by the graphene would make such materials or coatings far more durable than alginate alone. Flakes of graphene welded together by spark plasma sintering produce materials that may be suitable for use as bone implants.